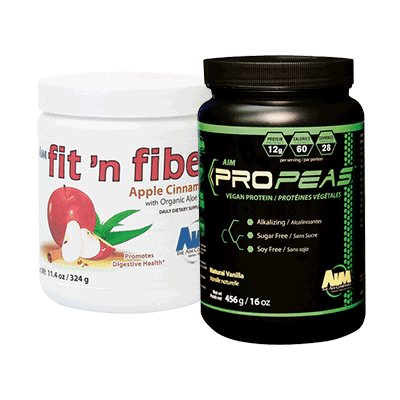 As complementary products, AIM ProPeas™ and AIM fit ‘n fiber® provide a means of weight management through unparalleled sources of protein and fiber. ProPeas contains 12 grams of protein per serving and uses allergen-free, non-GMO pea protein as its protein source. Fit ‘n fiber contains 12 total grams of fiber, including 10 grams of heart-healthy soluble fiber. Together, the nutrients from the two products assist weight management by decreasing appetite, offering a low-calorie, low-sugar, low-fat option for a meal or snack, and encouraging a healthy lifestyle through diet and exercise.